This week: “sanctuary city” status, decriminalizing agriculture, infinite street and sidewalk items. If you know of anyone else who’d like to get our weekly preview via email, the link is here. Sidewalk Repairs: There are so many items about specific sidewalk repairs on the agenda this week. If you’ve been wondering about your sidewalk, you might want to check the agenda. More Train Service: Mayor Petty has an item asking that city, state, and federal officials meet to figure out how to increase MBTA and Amtrak service between Worcester and Boston, Springfield, and New York City. If all goes well, in the next few years we will add hundreds of housing units a short walk from the train station, a housing expansion equal to roughly 1% of our total current housing. Stop Your Recycling from Blowing Around the Streets: Councilor Russell has an item asking the city to start cracking down on people who are overloading or badly packing their recycling bins, which causes their recycling to fall out and blow all over the neighborhood. As someone whose fence is perfectly oriented to snag the windblown recycling in our area, this idea makes me happy. Note also that there has been a proposal to switch from bins to clear trash bags for recycling, a change which would eliminate this issue. Allowing Commercial Agriculture: At one point it looked like city government might draft some zoning rules such that it would be possible to farm commercially in Worcester. Lately, this seems to have stalled out. So this week Councilor Rivera has an item asking for a progress report on this. Tax Breaks for Developers: Councilor Lukes has an item asking if, in the past five years, we’ve had any developers fail to comply with the terms of their tax breaks (Tax Increment Financing), and if so what the consequences for them have been. Sanctuary Cities: Whatever you want to call it, a lot of US municipal police departments avoid overly cooperating with federal immigration police unless it involves violent crimes, on the theory that plenty of people have friends and family in the country illegally, and that lots of people are going to be reluctant to talk to the police if there’s a risk somebody is going to get deported, and that we are all better off if people feel ok talking to the police to resolve actual violent crimes, thefts, and the like. This non-cooperation with immigration police takes various forms, for example if someone gets arrested and they are here illegally, the police would detain them the same amount of time they would detain a citizen they’d arrested, rather than holding them longer so that ICE could send someone to pick them up and deport them. Councilor Lukes has a series of items this week asking the Council to officially say that we want the Worcester police to cooperate fully with ICE in deporting illegal immigrants. Councilor Gaffney has a tiny item on the same topic but I can’t figure out if his item is written in such a way it would actually mean anything (also typos, c’mon Councilors, what the heck). People opposed to Lukes’s proposal will be demonstrating at City Hall starting at 6pm. Dog Park/Rules: Councilor Rivera wants a sign explaining dog rules at Maloney Field. Executive Session: The City Manager would like part of the meeting to be an executive (private) session for the Council to discuss a lawsuit between the city and Green Landscapes LLC. Private and Public Streets: Laurian Banciulescu wants the city to convert Denmark St. from private to public. 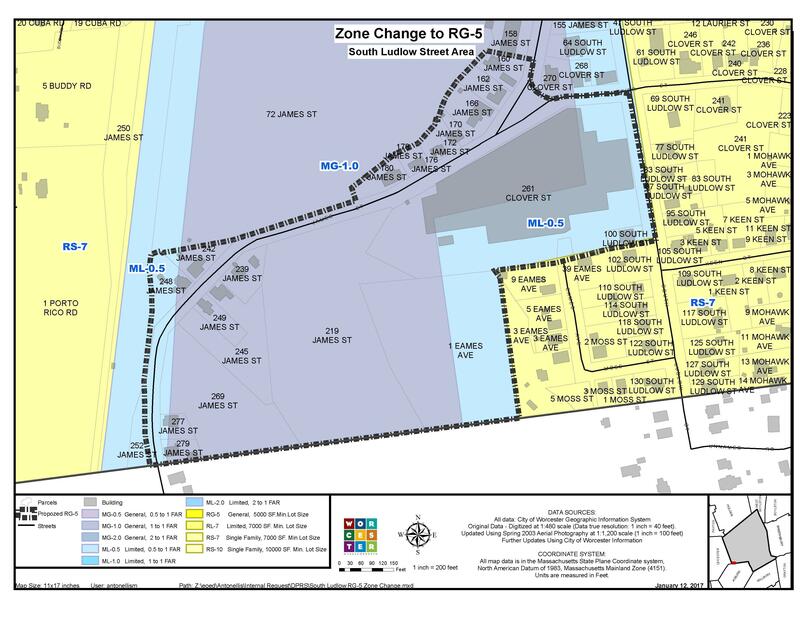 Rezoning Norfolk St: The Planning Board and the Economic Development Committee both want the Council to reject the request to rezone some parcels on Norfolk St to residential. The Worcester School Committee meets Thursday; you can find the agenda here. The big news will be FY18, of course, but that report isn’t yet posted. However, there is some news for FY17; namely, that the city DID in fact forward $70,000 from free cash when they closed the fiscal year to assist in saving the kindergarten aides! We aren’t there yet (if I’m reading this correctly, we’re still $300,000 or so short? ), but we’ve made progress. In the process, some budget related news: FY17’s statewide charter reimbursement line (identical to that proposed for FY18) was funded at only 46%, shorting Worcester $714,532 and the whole state by $54.2M. There are some recognitions, retirements, appointments, and one resignation which is of note: Grace Howard-Donlin, who resigned effective last week, was the appointed director of the international baccalaureate program, and had been charged with planning that. It appears that the last gasps of a hope of any such program in Worcester have (once again) died. There’s responses coming back on the Space Monkey Challenge (and dangers thereof) and attempting to expand the AVID program. There’s a request for this year’s incidents reports. There’s a request that math activities accompany summer reading lists (as they do already). There’s a request for a report on dual enrollment. There’s a request that Worcester’s colleges perhaps kick in for Worcester’s students AP exams. Those will go to Teaching, Learning, and Student Support; there is as yet no description of any of them. There are also requests that the School Committee accept donations of $292.20 and $1,212.49 for Woodland Academy and $400 for Forest Grove. *Yes, this is the ridiculous idea that started circulating at the last school committee meeting that the secondary school that most needs rebuilding should just get windows. PCBs remain in executive session; there is also collective bargaining with teachers and a grievance from an HVAC worker. I’m going to try to make the budget report this go-round. This week: rezoning, police, waterfront property taxes. If you know of anyone else who’d like to get our weekly preview via email, the link is here. If you want to read about the agenda in more detail, here’s the writeup in the T&G. Boards and Commissions: Robert Bolivar is being appointed a Constable; Courtney Ross Escobar is being appointed to the Historical Commission. The City Council will vote whether to reappoint Talena Ngo to the Citizens Advisory Council; Christian Escobar to the Conservation Commission; and Bill Eddy to the Worcester Housing Authority. Revised Tax Breaks: A couple years ago, to encourage someone to build 60 apartments at 100 Wall Street (the old El Morocco), the city offered a $1.2 million tax break in the form of a “tax increment exemption.” It’s taking them longer than originally planned, and the Manager would like the Council to amend the offer to reflect this delay. Rather than construction beginning this summer, it will now begin the summer of 2019. Still a Drought: Has all the rain helped our drought situation? A little bit; this week, we’re moving from Stage Three back down to a Stage Two drought. More Police: The Manager and the Police Chief would like to add 7 more police officers to the force. If I am reading the memo right there are currently 344 officers, with 23 positions vacant. Filling the vacancies and the new positions would have us at 374 officers. They would also like an additional 5 of those positions to become supervisory roles: sergeants, captains, lieutenants. Waterfront Property Assessments: Residents with waterfront property are unhappy they have seen unexpected increases in their property values this year, and thus increases in their property taxes. The City Assessor has a report to the Council explaining that these increases reflect higher selling prices for such property of late, rather than a new formula for calculating the values. The local taxpayer activist group AWARE is critical of this report, pointing out, for example, that property on gross or boring bodies of water still saw an increase comparable to property on nice ponds etc. A Market at the Aud? : Councilor Rosen proposes that we turn the long-vacant Worcester Memorial Auditorium in Lincoln Square into an “indoor retail and farmers marketplace” while we continue to wait for a motivated developer to do something else with the building.